As the perfect complement to Onkyo's high definition-compatible A/V receivers, the DV-BD606 Blu-ray Disc player is a welcome addition to the Onkyo line-up. This player takes any Blu-ray Disc title and delivers the full splendor of high-def 1080p video at 24 frames per second. It will also send Dolby(R) TrueHD or DTS-HD Master Audio(tm) surround sound-which boast the same quality as the original studio mix-to your compatible A/V receiver. 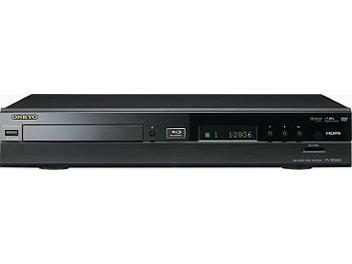 Thanks to its 1080p scaling, the DV-BD606 can also bring your DVD videos and DivX(R) video files into the high-def realm. And when it comes to music, it can play all your CDs and MP3s. Built with an eye to quality and reliability, the DV-BD606 is a recommended source for any Onkyo home theater system. *1 Discs that have not been properly finalized may be only partially playable or not playable at all. *2 An SD card with at least 256 MB capacity is required.